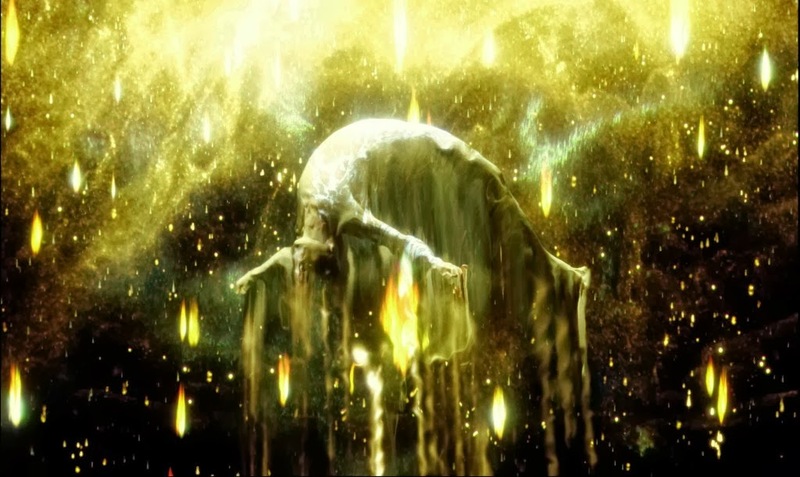 Darren Aronofsky’s 2006 film The Fountain is an evocative film for synthesizing Enlightenment thought. The film thematically deals with developing an enlightened approach to death and grief, and does so with a form that requires the viewer to entertain an aesthetic experience of sorts. More thematically than narratively, it is a film about how we process death, and the crises that the experience of grief can cull in our subconscious. In an unapologetically nonlinear fashion, the three linked protagonists of The Fountain are each on an existential, obsessive quest to defeat Death. Tomas the Conquistador is seeking the tree of life to save his Queen (Isabella) from death, Tommy Creo is compulsively experimenting on lab monkeys in an attempt to find a cure for his dying wife’s (Izzy’s) brain tumor, and Tom, an astronaut of sorts, is attempting to reach the dying star Xibalba to renew the dying tree of life that makes sustainable life in his biosphere possible. Ultimately the film and narrative move toward a more “enlightened” view of death and we see two of these characters die, Tomas dies (unacceptingly) even as he is immortalized in the living matter of the tree of life, and Tom the astronaut dies, (spectacularly) almost immediately after achieving an enlightened, unemotional state of mind about that inevitability. The quest to conquer death turns out to be really a quest to come to accept death. 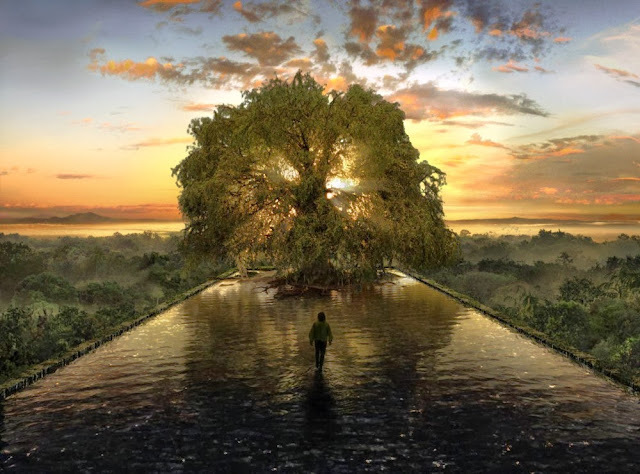 The Fountain, Aronofsky says, was “inspired by a series of conversations he had with Ari Handel, his former Harvard roommate, who has a PhD in neuroscience from New York University’s Center for Neural Science. In 1999, Handel and Aronofsky began to discuss the search for the Fountain of Youth and how ideas can interconnect like a Russian doll, with one fitting inside the other.”  This precise compartmentalization and interrelatedness is reminiscent of Immanuel Kant’s intense and nearly compulsive organization of human experience and judgment. David Hume said that no sentiment represents what is really in an object. In the film this idea is extended beyond objects to concepts. Tommy Creo’s sentiment of death was certainly not representative of how death came to be depicted in the film. His sentiment couldn’t have been more different from his wife’s, as she approached her eminent death with a more enlightened acceptance. The drastic difference in their behavior is reminiscent of Hume’s insistence that any two people, experiencing an object, will have different experiences or encounters with it. In the arc of the film, Tom/Tommy/Tomas must move past the first two of Immanuel Kant’s three types of judgment. He must overcome the agreeable/disagreeable, as exhibited by Tommy’s dismay at Izzy’s tolerance of the cold. He must also move past concerns about good and bad, especially as they relate to dying. Tomas being compelled to not kill the Inquisitor was a prominent example of this, but Tommy’s behavior during Izzy’s funeral also displayed a need for it. Ultimately, these linked characters moved (either themselves or the thematic gist of the film) toward an enlightened, almost “disinterested” attitude toward death. Ultimately, the idea of death was moved from the subjective to the objective, purged of individual, interested elements. The film attempted to maintain a relationship between the sensible and the supersensible. Kant proposed that “pure” judgment could transcend to the supersensible through the sensible. Certainly the film reaches and conveys supersensible inner lives of characters most effectively through the display of sensible, or sensory details in the physical interactions and environs of these characters. The use of the sensory experience of the viewer is also used to supersensory effect. The nonlinear editing of these stories evokes a fair amount of supersensory inference from a viewer based on contrast between the three parallel stories. The production design, post-production effects, cinematography, and sound all combine to create an intensely sensory experience that has the potential to be an aesthetic experience for a viewer regardless of plot of theme, but which can also be a great complement to both plot and theme, depending on a viewer’s interpretation of either. Science, Religion, and Art also played important roles in creating the visual themes and motifs of the film. 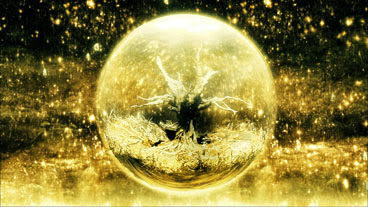 Aronofsky also referenced how the organic, ecosphere design for the futuristic astronaut came to embody the spherical motifs of that futuristic story. The conquistador’s realm, infused with both Christian and Mayan religion was replete with triangles, while rectangles were more prevalent in Tommy and Izzy’s reality. There were also heavy visual motifs in the use of color (both in set/costume and in cinematography) Darker, more unenlightened attitudes toward death tended to be represented by darker, blacker motifs, but as death was explored golden colors and effects became prevalent, and the ultimate, enlightened acceptance of death was represented by bright whites (nearly universally worn by Izzy). As gorgeous as the golden visuals are, they actually seem to embody a fearful paranoia for the protagonists. There is a suggestion that this human obsession with avoiding death is utterly defeatist. There are attempts at representing the beautiful within this film as well as attempts at representing the sublime. In a way, the film treats death as the ultimate sublime. Certainly the repeated mantra, “Death is the road to awe,” is fully in keeping with Kant’s treatment of the sublime. Death is the ultimate unknowable, incomprehensible experience. Toward the end of the film, the non-linearity increases as the three separate time periods begin to conflate. Aronofsky cuts between the three separate time periods in bewildering fashion, Clint Mansell’s music gets more intense as time periods blur together. A Mayan temple guardian sees a vision of Tom the astronaut, Tomas the conquistador sees the star of Xibalba as soon as he drinks of the sap of the Tree of Life, Izzy takes a seed from the newly bloomed Tree and gives it to Tommy. Sublimity was most obviously approached at the end of this sequence. The film built intensity steadily through quickened editing, combining previously disparate plot points, increasing the volume and tempo of the music, and even increasing the visual brightness in the scene. It was a sensory crescendo. With interesting effectiveness, the score and editing switched to a period of silence and stillness just before the tremendously loud and sudden orchestral cue of Xibalaba’s star blowing into a supernova. In the final scene, when Tom arrives at an enlightened view of death, he is able to say, “I’m going to die,” without any negative emotion attached. The intensely emotional paranoia and blatant denial that the 3 protagonists have held against death are ultimately swallowed up in a detached, peaceful acceptance. In a way, he seems to have arrived at this transcendence in a manner similar to that proscribed by Hume for achieving the “Delicacy of imagination” required for good taste. Tom’s character appears to have had repeated, exploratory experience with the episodes of Tommy’s and Tomas’ stories. This repeated, probing experience seems to be what ultimately enables Tom to “finish” the story. He is finally free from prejudice about death. Aronofsky’s insights into the nature of this enlightenment are interestingly almost contradictory to a Kantian view of enlightenment. “Search for order [immortality], and only chaos[death] will infect your life. Embrace the chaos [death], however, and the world feels like it has more order [life] than ever before.” Telling Kant that enlightenment involves embracing chaos sounds like it would have made his head explode, rather in the manner of that sublime death of Xibalba.